HMH Books for Young Readers, 9780152014957, 32pp. Murray has to get dressed for school. But his pants don’t want to go! They hide under the bed! They run around the room! And they end up swinging from the ceiling light! Murray’s socks try to help; his belt offers to lasso them. But the pants won’t come down-until Murray offers them a treat they can’t resist. MORDECAI GERSTEIN studied art at the Chouinard Art Institute in Los Angeles and has designed and directed animated films. 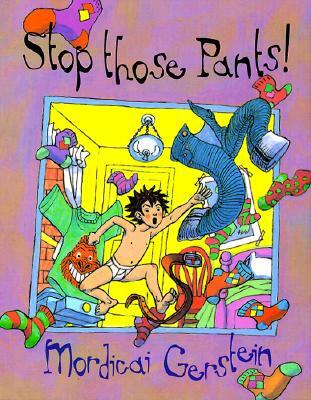 He is the author-illustrator of many books for children, including Stop Those Pants! Mr. Gerstein lives in western Massachusetts.